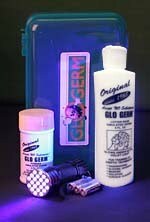 Glo Germ kits are available on Amazon. However, you can now get free shipping for Glo Germ right here from OUTFOX. Choose any of the following free shipping options below. If your shopping cart is showing shipping (I.e. If you ordered something not on this free-shipping list) then we'll refund your shipping if you mention "Amazon" in your order notes. Choose us as your infection control supplier and not rely on a generic retailer like Amazon.com. In addition to free shipping, you can purchase Glo Germ tax-free if your organization is tax exempt. Tax exempt orders should be emailed to info@OUTFOXprevention.com . Please let us know if you want to pay by purchase order (PO) or credit card and we'll arrange your order. (2 oz Mini Gel of Surface Cleaning Detection Material) **Must be wiped off- does not work with spray on disinfectants unless physically wiped clean.